For ultimate relaxation on holiday, every member of the family must be able to unwind one hundred percent. And for many, this means renting a luxury villa with ultimate privacy. Properties in gated communities offer just this, and much, much more. All of the gated domains in our portfolio of villas to rent ensure high quality privacy and security with sophisticated and state-of-the-art security systems whist also offering first class leisure facilities, beautiful gardens and some – even their own private beaches. This villa is set in arguably the most prestigious and sought after secured domain in Saint Tropez, les Parcs de St Tropez. The five bedroom villa boasts a large, flat garden with its own swimming pool and parking for several cars. It can easily accommodate 10 guests. Villa Mouttier is a beautiful family home just a five minute walk from the beach set within the private domain of Les Parcs de la Moutte. The five bedroom, five bathroom property has its own beautiful Mediterranean garden with swimming pool, but also benefits from tennis courts and another swimming pool within the grounds of the domain. This villa is another five bedroom villa set within one of Saint Tropez’s most prestigious gated domains, Cap Tahiti. 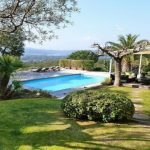 The views from this luxury property are particularly stunning, and its central position means that holidaymakers are close to both the centre of Saint Tropez and its beautiful beaches. The villa boasts its own swimming pool and enjoys ultimate security. Villa is a stunning villa commanding a prized location in La Capilla private domain which is just three minutes’ walk from Pampelonne Beach. This six bedroom villa is set in a huge garden with breathtaking views and has plenty of space for the family and friends. Maid service is also available with this property. Villa Origan is a charming four bedroom property located in the small private domain of La Castelane, a stone’s throw from Bouillabaisse beach and not much further from the centre of Saint Tropez. The modern villa sits in beautiful gardens and also has its own pool.